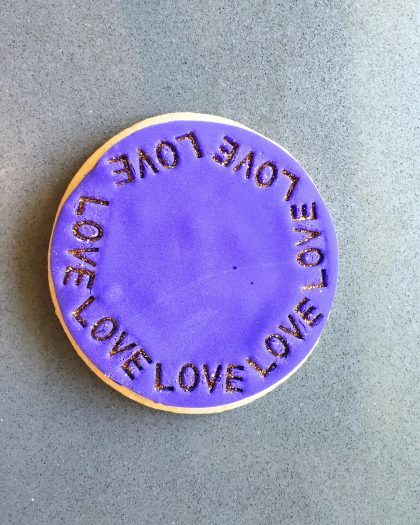 I love purple Valentine’s Day cookies. Because why should pink have all the fun? I mean really. Purple is energetic and elegant at the same time. Royal and bright. Okay, okay, I will admit, these cookies were originally intended to be white. What? I know. Let me explain. My friend Laura and I were prepping for a baking date together. 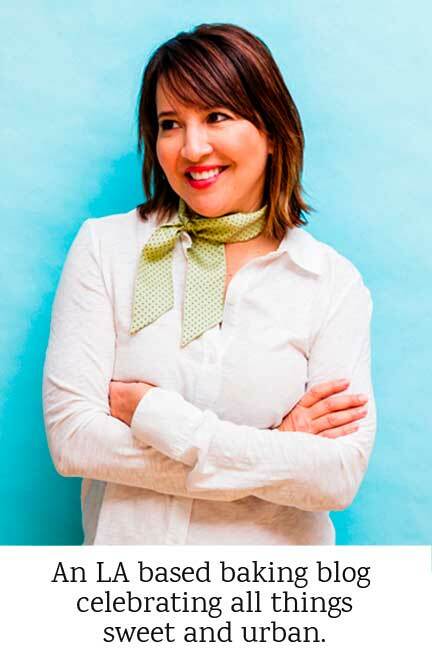 You may remember her from amazing recipes such as the Blueberry Milk Crumble and Lemon Lingonberry Cake. The woman has mad skills. Anyway, I was in charge of getting the fondant and as it turned out I unwittingly bought purple. I wanted to die. Thankfully, Laura is awesome. She laughed it off and we got busy working on our purple Valentine’s Day cookies. And you know what? We loved what we came up with. I mean really, aren’t we all ready for a break from the pink right about this time of year? First things first, you will need the cookies to decorate. Follow this easy sugar cookie recipe. 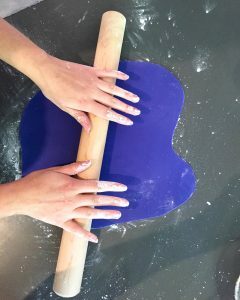 Next, comes the purple fondant fun. 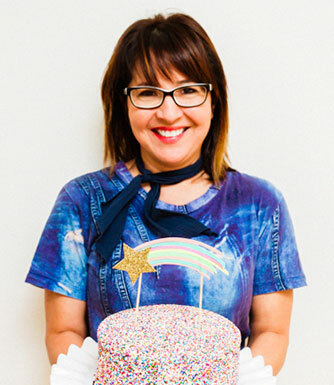 To be clear, I’m no fondant expert, so finding a fondant that’s easy to work with is key. For me, I find Satin Ice Fondant a great fit. Billed as “sturdy” it still rolls out beautifully. I sprinkle a bit of cornstarch while rolling it (to prevent sticking) and then use a knife or a pizza cutter to trim the fondant to match the cookie. 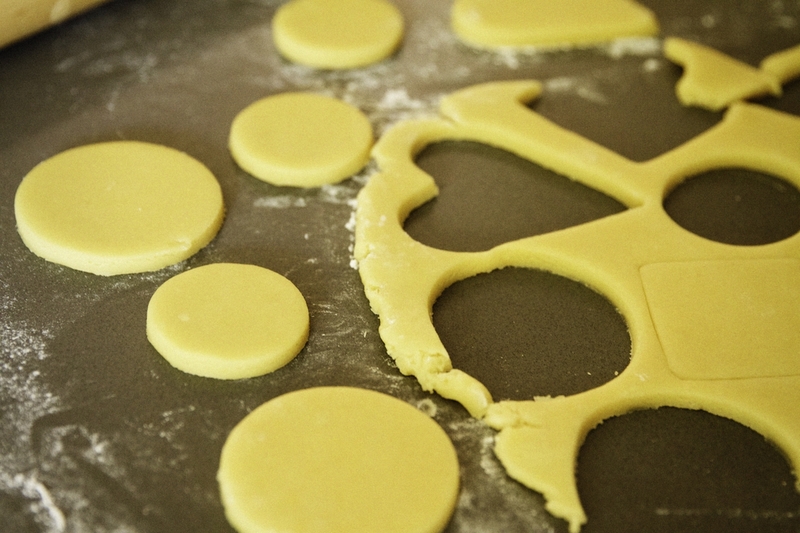 The next step is to adhere the fondant cutout to your cookie. I used Wilton’s piping gel, but there are so many ways to do this. If you don’t have piping gel on hand, try brushing a little bit of corn syrup between the cookie and the fondant. Or you can try your hand at making edible glue. 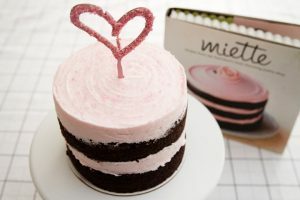 Sweetopia.net has a great post on how to make it. I the stencils by Heidi Swapp and The Cookie Countess. They have some awesome polka dot, mini hearts, and holiday shaped stencils. For edible sprays, I lean toward Chefmaster ($10) and Wiltons Color Mist ($6). I used Wilton’s Pearl to get the best contrast against the dark fondant. Hold the spray can at a reasonable distance and spray with a steady, light mist. I use both hands, one to hold down the stencil so it doesn’t move, and one to spray. 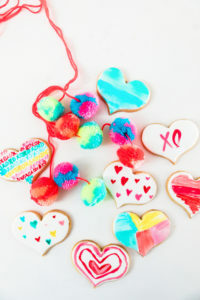 If you really want to get into it, check out the Cookie Countess, she has a ton of how-to videos on her blog. 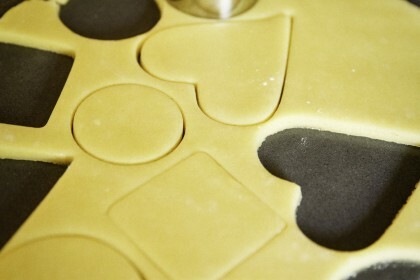 She also has magnets that you can purchase to help hold the stencil in place while you spray the cookie. This will take a moment to get use to, but don’t despair, practice makes perfect. Another fun way to decorate the fondant is with embossing imprints. These are basically thick stamps, designed specifically for this purpose. Simply apply pressure where you want the design. You will feel the mold push into the fondant, then release by lifting up. I love this creative option because of the ability to customize your message. You can go simple, or layer up the effects for a more dramatic look. For the round purple sugar cookie, I used a simple method called embossing. I started with imprinting “LOVE” in a circular motion. 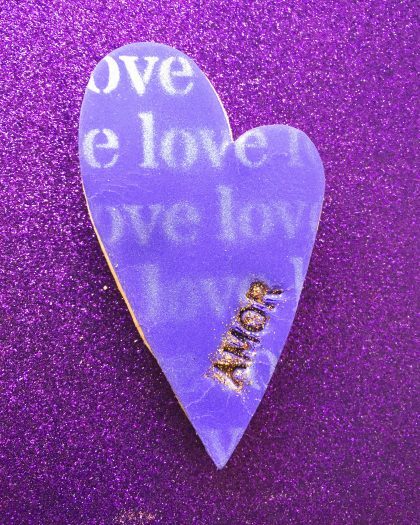 Then, i brushed on some corn syrup inside the love lettering and then sprinkled it with gold disco glitter (edible). For the heart, we did three different layers of decoration. We started with a stencil with the word love, then imprinted, and topped off with gold disco glitter. 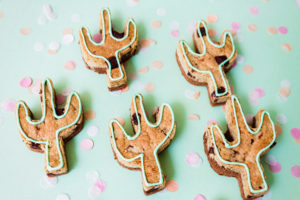 Have fun, spraying and imprinting into the cookie, the fondant, or both. And remember, just because it’s Valentine’s Day, doesn’t mean it has to be pink. 1Dries: Whisk flour and salt in a bowl. Set aside. 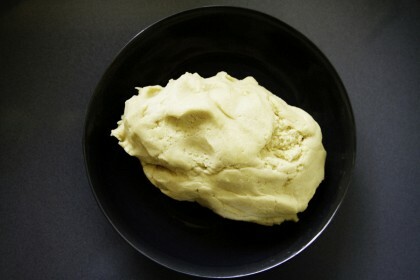 2Base: In a mixer, cream together butter and sugar. Next, add eggs, vanilla and optional flavorings of citrus zest or spices (ie: cardamom). 3Gradually, add dries to base just until incorporated. Chill in refrigerator up to one hour. Roll on lightly floured surface. Cut shapes. 4Bake at 350F for 8-10 minutes or until edges are slightly browned. 5Note: When you cut into a shape, chill in freezer to set. Then, transfer directly to hot oven. Tip: Once you cut your cookies into your desired shapes, wrap and place in freezer. Then, bake off the next day. 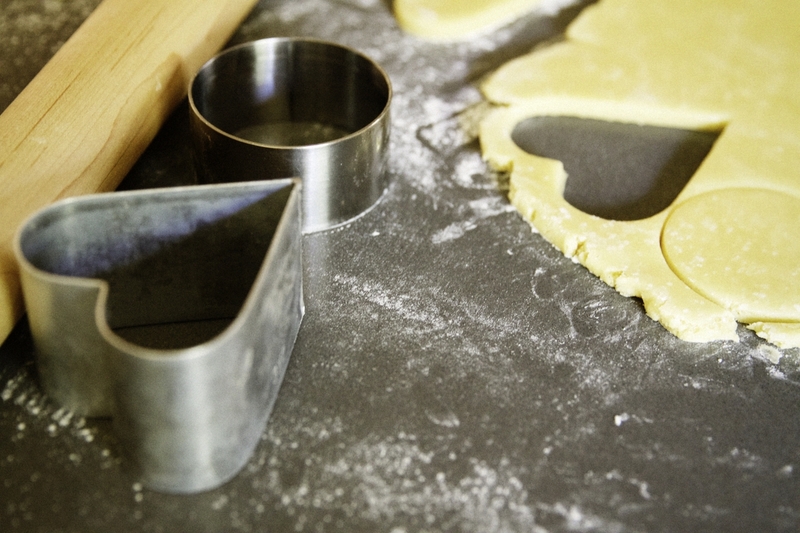 Move from freezer to oven and the shapes will retain their integrity during the baking process. This is how you get those perfectly shaped cut-out cookies! 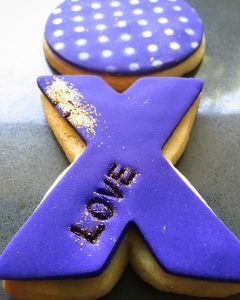 I love these purple Valentine’s Day cookies! Not only is the change from traditional pink, white, and red refreshing, but the embossed words and designs are such a lovely touch! Thanks Kathleen. Yeah, purple is stealing the show right now in my house! Cheers. Thanks – Purple really came through and helped me recover big-time. Thank you! I can’t stand pink. I know I’m not really allowed to say that this time of year, but there, I said it. These are gorgeous. And I bet they really pop on a plate covered in pink. Thanks Cindy! So funny! Yes, you can’t say that, but I am sure glad you did. Tell me how you really feel. I enjoy baking. 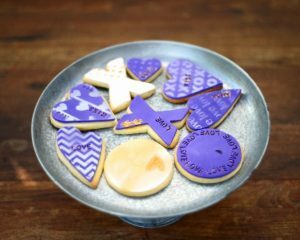 Stencils would make my cookies personalized and just plain awesome. Stencils are so easy and cool. Most people get a little freaked out with spraying, but once you do one or two cookies, I promise you will get the hang of it. 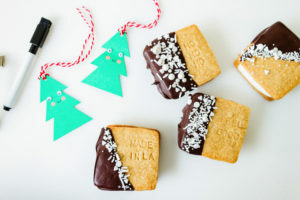 These cookies are simply stunning! I love pink, but looks like purple might be my new pink, when I make these beauties. Sugar cookies are a family favorite, so it’s a win-win for us! 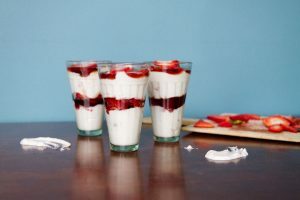 Thank you for sharing this bold and beautiful recipe! Shucks! Thanks Rose Marie. I agree purple is the new pink! Thanks for following.